I have a confession to make. Shhhh… don’t tell my kids, but I really don’t like geology. I know it’s kind of hard to believe as I share science activities all the time, but I much prefer any kind of life science. In fact, geology was the one college class I almost failed. I’m totally serious. There was just something about the study of rocks and minerals (and the strange professor who looked at them so lovingly) that completely turned me off of the subject. But my kids are always coming home with pocketsful of rocks and sand, and love to ask questions about their findings as they display them (everywhere!) for the world to see, and since I embrace a self-directed view of education, I decided it was high time to give in and help them learn about all things rocks, minerals, and gemstones. I’m working in partnership with Home Science Tools and was provided materials and compensated for my time in creating this post. Because I adore my crazily curious learners, I dove head-first into all things geology, and have actually had fun coming up with ways for them to learn all about this topic. Starting any kind of new unit study can be challenging around here, and I never know exactly what will take. I don’t like to force learning on the kids — especially in the content areas like science and history because I truly believe that the best learning is self directed. 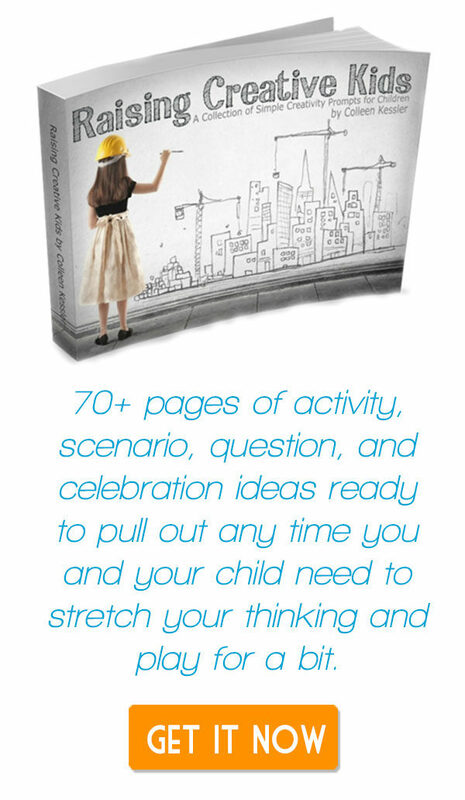 I tend to strew materials out when I’m trying to pique a kiddo’s interest in something, and while the very philiosophy behind strewing insists that we strew-ers don’t come to the table with any expectations, I’ve learned over time how and what to put out that will ensure that someone is interested and then drags another one of the kiddos into the adventure. Strewing to build an interest in geology can be as simple as laying out some rocks and minerals, along with magnifying glasses and other tools. We went a little further this time thanks to the amazing rock collection and mineral test kit from Home Science Tools I chose for the kids who have been begging me to get them obsidian and some of the other rocks they know from games like Minecraft. To pique the kids’ interest, I set out the rock specimens, the testing kit, some magnifying loupes, and their science journals one night before I went to sleep. The five year old was up first (as usual) and he dove right in, looking at each rock through the loupe. Throughout that first day the kids went back and forth between the rock specimens and their journals. My eleven year old decided that I hadn’t set out enough information, so she pulled out her chromebook and set about learning all she could and peppered us with fact throughout the day. 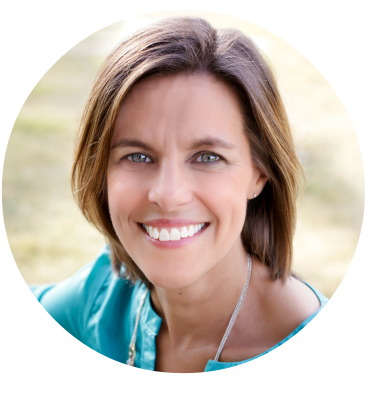 Inspired by her sleuthing, she pulled open her science notebook and recorded facts inside while the younger two kiddos watercolored in theirs. The best thing about self-directed learning, and following our children’s interests in this way, is that learning takes on a life of its own. 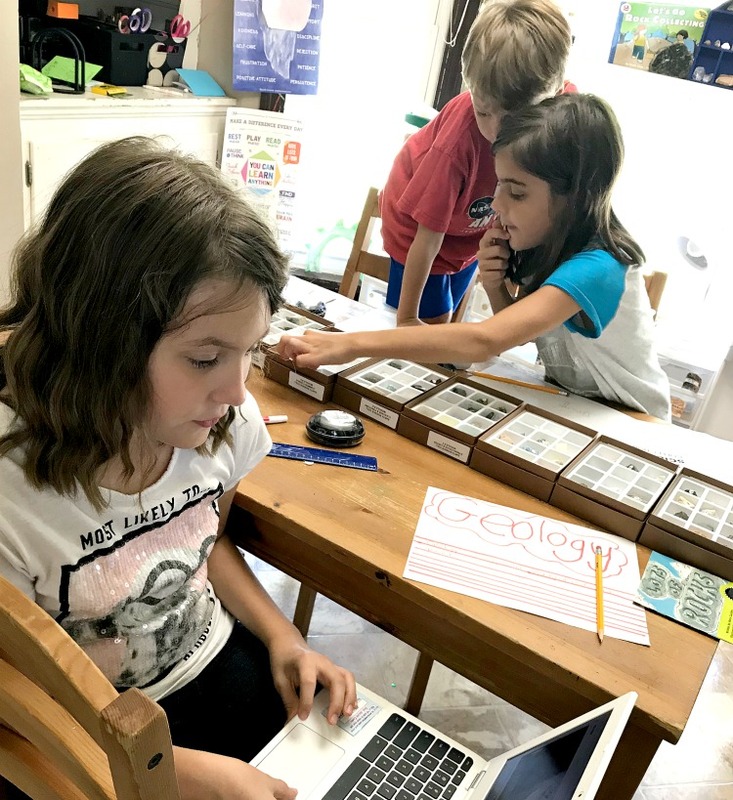 Since strewing the amazing rock specimens and mineral testing kit out, my kids have watched documentaries, dived into websites, and have talked about rocks, minerals, and fossils for weeks. In fact, they’re so excited about the topic, the littlest guy asked if I could teach his class at co-op next session all about it. And now we’re diving in to a full-blown unit study on all things geology. 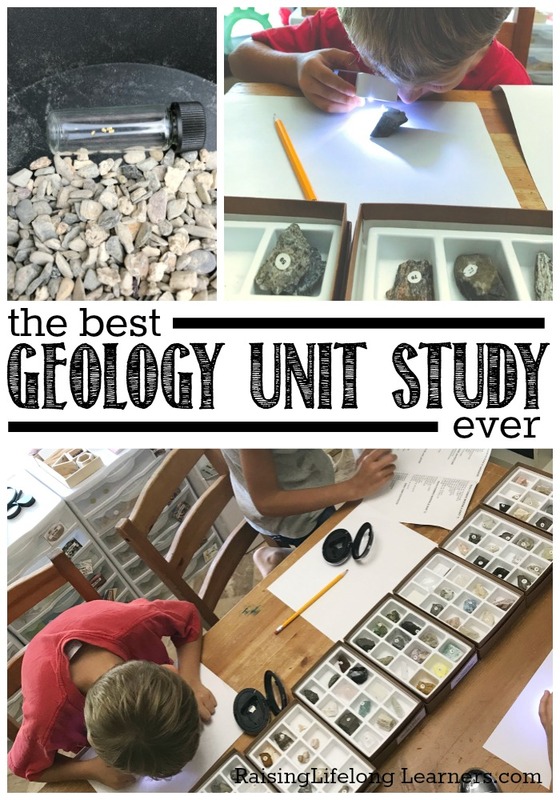 There are so many great things to do within a geology unit study and, truthfully, my kiddos are just scratching the surface and getting started. We have activities planned to roll out in the coming weeks. The first, and easiest activity was the one we started with. 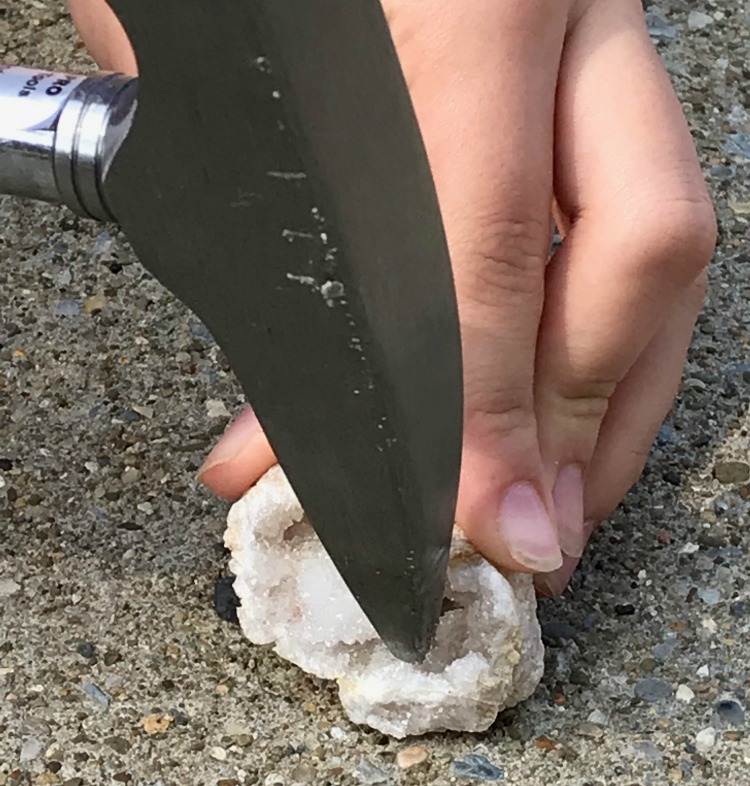 Breaking open geodes is something simple, yet so much fun for kids of all ages. It’s like opening a little treasure box. Spherical rocks with hollow cavities that are lined with crystals can be formed in different ways. With volcanic rock, geodes start as bubbles. In sedimentary rock, geodes cans start as animal burrows, mud bubbles, and even tree roots. Over time groundwater seeps into the cavity, picking up various minerals as it fills. Those minerals, including amethyst, quartz, and calcite, dissolve after thousands of years, leaving a unique layering of crystals and colors. Each geode is completely different from every other — kind of like a fingerprint — because it has a unique composition. You and your kiddos can find out what’s inside by cracking them open using a rock pick or a rock saw. We used rock picks and geodes we ordered from Home Science Tools. Weathering is a chemical or physical process that breaks down rocks to form sediments. It can be caused by wind, water, ice, or even animals. Erosion is a physical process that moves sediments from one place to another over time. A rock tumbler is a super-fun tool that can help simulate erosion in a stream as it churns sand, rocks, and water around and around in its drum over the course of a few weeks. We’ve had a couple of toy-grade rock tumblers in the past, but they haven’t been very successful. They have all been loud, cumbersome, and only partially polish the rocks we put inside. 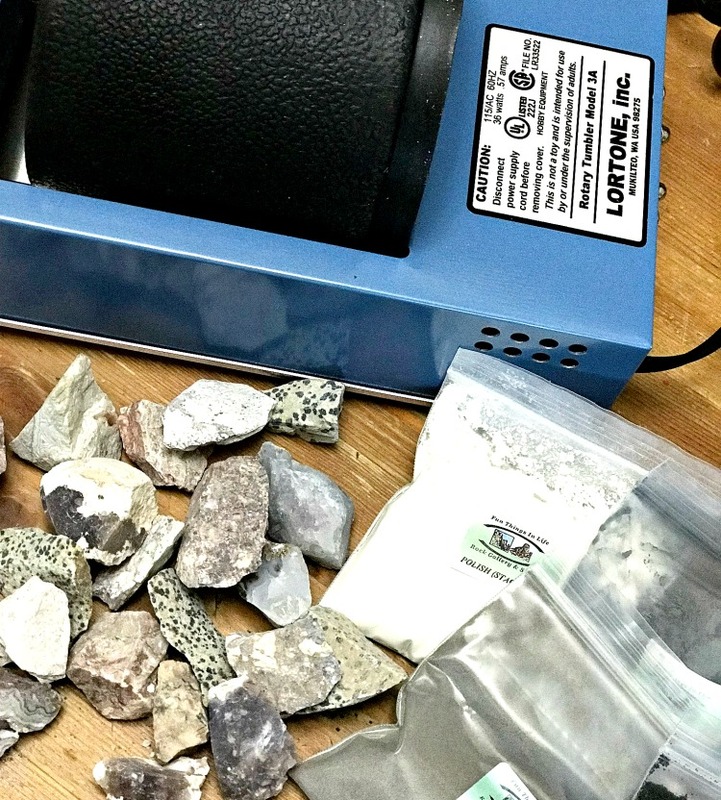 Because the kids were so interested, we ordered a much nicer rock tumbler than we’ve ever had before from Home Science Tools, and it’s been so worth it. This tumbler will stand the test of time. Its rubber drum is the quietest I’ve ever heard in a tumbler. Now, it’s not completely silent, as we are running a drum-full of rocks around and around, but it’s quiet enough to keep in the basement instead of relegating it to our damp garage for the neighbors to wonder over. Our rocks are currently tumbling, and we can’t wait to see the results in a few weeks. 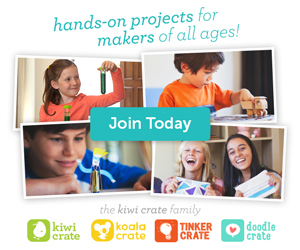 At that time, I plan to strew lapidary and jewelry-making supplies to feed my kids’ creativity. (I’m hoping they’ll dive into handmade Christmas present-making.) I’m looking forward to seeing some of the craft ideas they come up with when their stones are finished and brightly polished. Gemstones are pieces of mineral crystals that have been cut and polished. They’re typically used in art or jewelry making. Gold and other precious metals are also used in jewelry making, art, and can be used as currency. The cool thing about gems and precious metals is that they can be found all over the world. 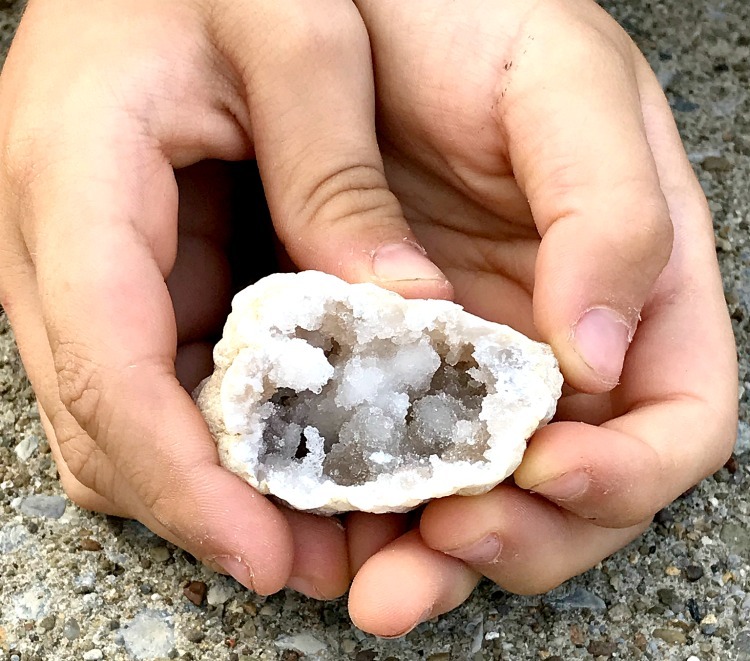 With a quick Google search, the kids and I found out that minerals like calcite, celestite, pyrite, selenite, gypsum, and sphalerite, along with flint, gold, rare meteroites, and diamonds can be found in Ohio. 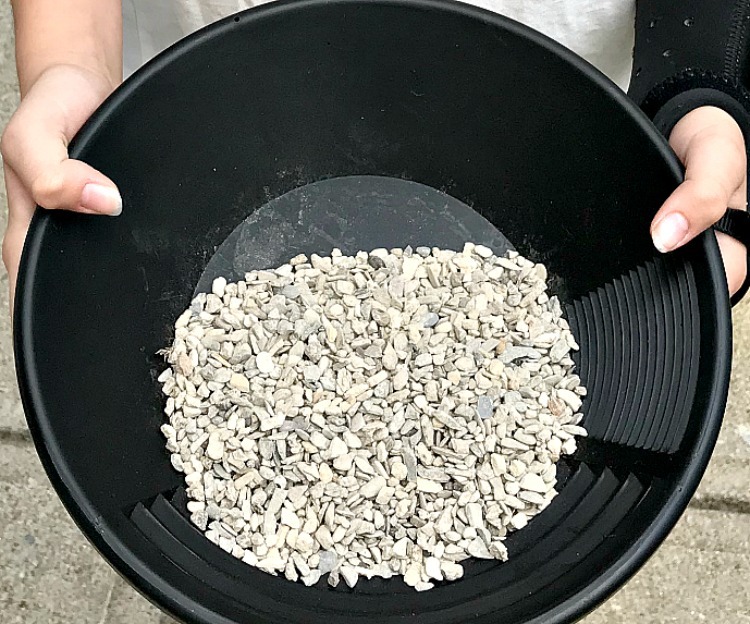 The idea of hunting for gems or panning for gold was a huge hit with the kiddos, and I wanted them to have some success up front so I ordered the gold panning kit from Home Science Tools. 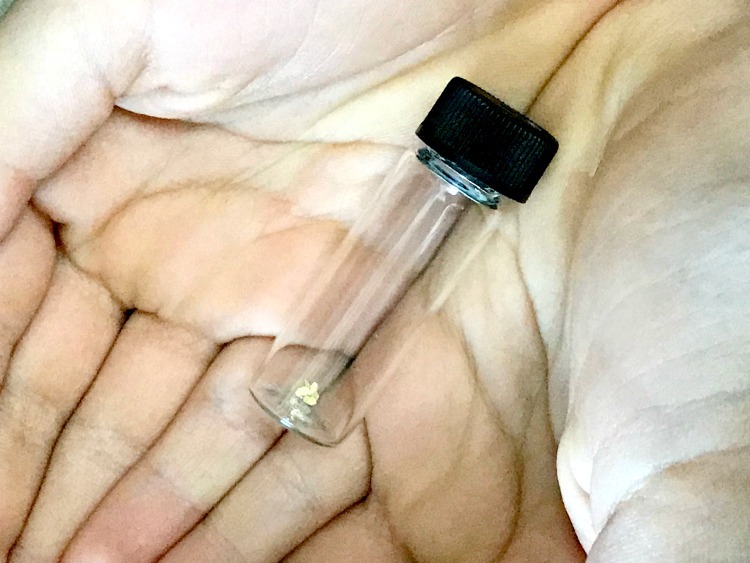 Learning that pure gold has a specific gravity that is over 19 times heavier than water, and that most other sand, rocks, and minerals are far lighter was super interesting. I’d never realized why panning in water like that worked so well. I had been confused, thinking that the gold would just wash right out of the pan like everything else, but now I know exactly why the gold flakes fall to the bottom of the pan — and so do the kids. I think that was my favorite part of this study so far. What’s Next When it Comes to Geology? The cool thing about a study like this is that it can be revisited again and again. I’m planning to bring in geology books, games, and rock hunt hikes this fall for as long as the kids are interested in learning about rocks, gems, and minerals. 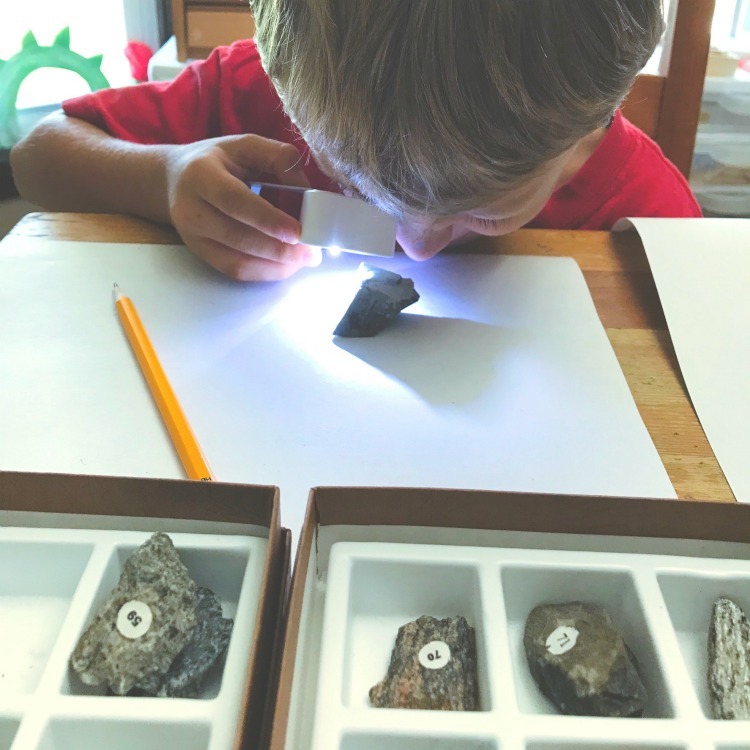 The best part, though, is that materials like the ones we’ve already collected last forever, and for a topic like geology — where there’s always more to learn — they can be brought out again and again. 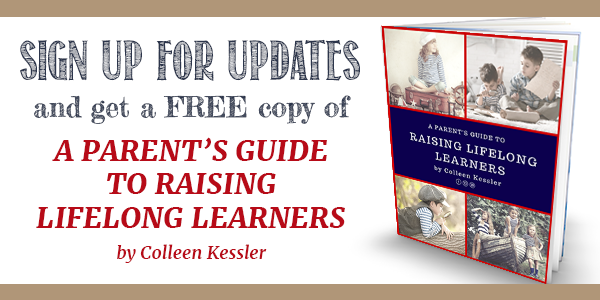 I’ll keep sharing as we do more — you’ll want to follow along on Instagram — but if your kiddos are interested in this topic, the things I’ve shared here are a great place to start because they’re high-quality and high-interest — the two characteristics that make up the best homeschooling materials.